This exciting canoe trip will give you five days of Wilderness Canoe Camping in the heart of the world famous Algonquin Park. This huge wilderness Park is the oldest, and one of the largest in Ontario. The park was established in 1893 and comprises an astonishing 7,725 square kilometres of forests, lakes, and rivers. It is 1.5 times larger than Prince Edward Island, ¼ the size of Hawaii, the same size as Wales, three times larger than Luxembourg, and seven times larger than Hong Kong! Within its borders can be found moose, deer, beaver, hawks, eagles, bears, and even wolves! For five days we will be living much like the Natives and early explorers did. Travelling by two person canoe, we paddle across many lakes, portage over forest trails, swim in clear clean waters, cook by a fire, and sleep in tents under the stars. 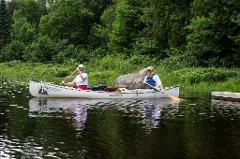 We will cover about 10-20 km per day of wilderness canoe routes, with one day out for hiking or relaxing by the water. We can almost guarantee that we will come across a moose or two grazing by the waters edge. If we’re lucky we may even hear wolves howling in the distance at night! We provide all food, permits, a knowledgeable guide, and all equipment (except personal items like sleeping bags and flashlights – a packing check list is provided). We can even provide transportation from Toronto as an option. Pickup at Finch Subway Station in Toronto (optional) or meet us in Algonquin Park. After a leisurely drive through the heart of Ontario farm land and cottage country we will meet our group at Permit Office at Rock Lake. After taking care of the necessary paper work our guide will instruct everyone on the necessary skills and techniques for canoeing. You will learn how to properly load a canoe, how to paddle in a straight line, and how to portage your canoes. You start your canoe trip down a slow moving river that spills out into Rock Lake. You will spend the next 1 1/2 hours paddling across Rock Lake to get to the short portage into Pen Lake. This lake is where you will find your first campsite in Algonquin Park. Once you establish camp, with the help of our experienced guide, you are free to explore the lake you are on. Also, in this area it is quite common to see moose grazing by the edge of the lake. Dinner will consist of fresh food, prepared on site, and enjoyed by the side of a blazing campfire! Afterwards, you can sit and watch the Milky Way rise slowly above your heads. The sky is so clear that you can even count satellites passing by! And, if you’re really lucky, a pack of wolves may serenade you with their howls! This is real Canadian camping! 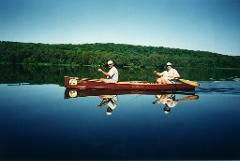 Today we will canoe even farther into the interior of Algonquin Park, exploring two more lakes. We will encounter some short portages and one long portage that takes you to a nice beach on Welcome Lake. And, after a welcome break and a swim, you continue canoeing across the lake and into a twisting river that leads into Harry Lake. This is where you will find your campsite for your second night in Algonquin Park. Today you don’t canoe too many kilometres, but it is a fairly tiring day due to the portages. You will canoe across three small lakes and do two big portages. But you end up at one of the most beautiful lakes in Algonquin Park, Lake Louisa. It is a big lake with many small islands, some of which have campsites you can stay at. You should get to your campsite by mid-afternoon so you will have plenty of time to relax or do a bit more canoeing. Your final day begins with a hearty breakfast. You pack up camp, load the canoes and start the paddle home. This is a challenging day, but since you are well rested from yesterday, you should easily be able to manage the 2.9 kilometre portage that awaits you. You will arrive at Rock Lake by early afternoon and have a short canoe trip back to the parking lot, arriving back to your vehicles about 2 pm. You then start the drive back to Toronto. For those who requested transportation to/from Toronto, you will be dropped off at Finch subway station at about 7 pm. After this five day canoe adventure, you can definitely say that you have answered the Call Of The Wild! Exploring Algonquin Park – Civilized at first & Wild at the end! This is a great family canoe trip. A perfect way to spend some quality time with your kids in a wonderfully natural setting. You get three days at the unique Algonquin Eco-Lodge combined with a guided three or four day wilderness canoe trip in Algonquin Park. Call Of The Wild’s Algonquin Eco-Lodge, located beside an active beaver pond (Moffat Pond) and a cascading waterfall, is on the southern border of Algonquin Park. It is a wilderness enthusiasts’ dream with plenty to do and see. The Eco-Lodge is a great place for hiking, fishing, nature walks, wildflower exploration, birding, canoeing, and mountain biking. For kids, the Eco-Lodge is a dream come true. Guaranteed fishing (they’re small, but still fun to catch), lots of frogs, salamanders, butterflies, trails to explore, canoes and water toys. We also do wolf howls around the bonfire, and can teach them how to howl for wolves. 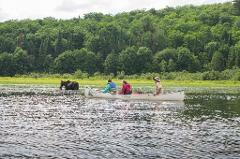 The Algonquin Explorer trip is an ideal way to ease yourself into the wilderness. You will stay at the Eco-Lodge. where you are in a wild, natural setting, but still have the comforts of civilization. Things like hot showers, indoor plumbing, and even an outdoor hot tub! And all of these comforts are thanks to our micro-hydro generator that creates all of our electricity from our waterfall. Wile at the Lodge you can learn your basic canoe strokes, how to start a campfire, and how to howl for wolves! You stay at the Eco-Lodge for three days and nights before you start your Algonquin Park canoe trip of another three or four days. You will have to drive 1.5 hours to our put-in point, but you have plenty of time and it is a nice way to see more of the Algonquin countryside. Below is a suggested itinerary (self guided) for the first three days of your visit. 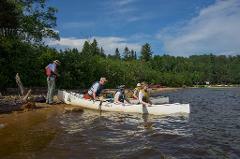 Enjoy the free use of canoes and paddle into Algonquin Park via the York River. Experience portaging around several rapids and waterfalls (High Falls, Gut Rapids, The Chute). The pools below the falls are excellent places to go in for a swim. Continue paddling up to Byers Lake. Spend some time swimming, have your picnic lunch, etc. This lake provides an excellent opportunity to see beaver as there are several beaver lodges in it. It is also a good place to spot deer. Fishing – Bass, Lake Trout, Brook Trout. Requires Fishing License which can be purchased nearby. In addition to these activities, the following activities are also available in the immediate area. Some involve additional costs, and we will be happy to arrange any required reservations. After you have enjoyed a taste of Algonquin Park, it is now time to experience a more rugged look at what the park has to offer, from the bow of a canoe. We spend the next 3 or 4 days on a canoe adventure meandering through some of the 2,000 lakes and rivers in the Algonquin Park interior. The trip is geared for the beginner and we will teach you all the paddling skills you need in order to have the adventure of a lifetime. We also provide all food, all equipment (except personal items like sleeping bags, flashlights – a packing check list is provided, and these items can be rented). You will need to drive up to our “put in” point, on Rock Lake. It is about a 1 ½ hour drive from the lodge, along a scenic highway. You will meet your guide and the rest of the group at the Permit Office at Rock Lake. Once all the required camping and parking permits are obtained your guide will give you some information about your next few days. The canoe guide will go over the basic canoe paddling strokes, show you on the map where you will be going, and discuss general safety issues. The full itinerary of the three day canoe trip is listed below. Departures: Tuesdays - Self Drive only – arrive at the Eco-Lodge after 2pm. Note: There is a resident dog at the Eco-Lodge, so if you have pet allergies please bring some medication. We can also assign you a cabin room, which is a “pet free” zone. This is a great family canoe trip. A perfect way to spend some quality time with your kids in a wonderfully natural setting. You get three days at the unique Algonquin Eco-Lodge combined with a guided four day wilderness canoe trip in Algonquin Park. You stay at the Eco-Lodge for three days and nights before you start your Algonquin Park canoe trip of another four days. You will have to drive 1.5 hours to our put-in point, but you have plenty of time and it is a nice way to see more of the Algonquin countryside. After you have enjoyed a taste of Algonquin Park, it is now time to experience a more rugged look at what the park has to offer, from the bow of a canoe. We spend the next 4 days on a canoe adventure meandering through some of the 2,000 lakes and rivers in the Algonquin Park interior. The trip is geared for the beginner and we will teach you all the paddling skills you need in order to have the adventure of a lifetime. We also provide all food, all equipment (except personal items like sleeping bags, flashlights – a packing check list is provided, and these items can be rented). The full itinerary of the four day canoe trip is listed below. Departures: Fridays - Self Drive only – arrive at the Eco-Lodge after 2pm.